BUDAPEST (Reuters) - Secretary of State Mike Pompeo cautioned U.S. allies on Monday against deploying equipment from Chinese telecoms giant Huawei on their soil, saying it would make it more difficult for Washington to "partner alongside them". 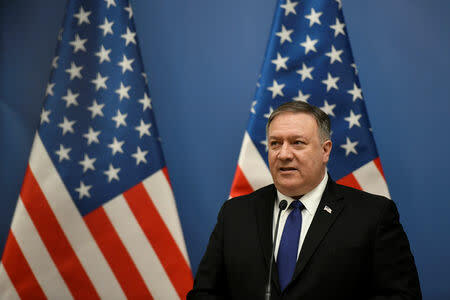 "We have seen this all around the world, it also makes it more difficult for America to be present," Pompeo told reporters during a stop at the U.S. embassy," referring to Huawei equipment. "If that equipment is co-located where we have important American systems, it makes it more difficult for us to partner alongside them." "When it comes to cooperation with Russia or cooperation with the People's Republic of China that does not harm us being reliable as a NATO ally," he told a joint news conference with his U.S. counterpart.